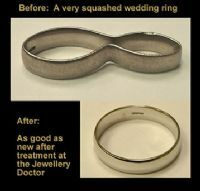 If your engagement ring, wedding ring or any other type of ring is in need of repair, the Jewellery Doctor can help. The expert service includes replacing stones, ring sizing and repairing damaged claws and ring shanks. We tackle repairs that other jewellers won't attempt and pride ourselves in our high repair standards. All jewellery repair work is guaranteed for one year. Rhodium plating – rhodium plating makes jewellery more durable. It enhances the reflectivity of your ring and can for example, make diamonds look more brilliant. 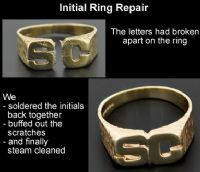 There are many different types of ring repairs we provide. If you’d like to know if we can repair your ring, please contact us for details and a fast, free quotation.